Today will be a fun day of tips and quotes, and hopefully you'll start feeling a little "green"! ﻿TIP: Time to check the closet and make sure you have some green to wear on Mar. 15th. If it needs cleaning or mending, do it now! Scrapbooking and Kirigami really complement each other. 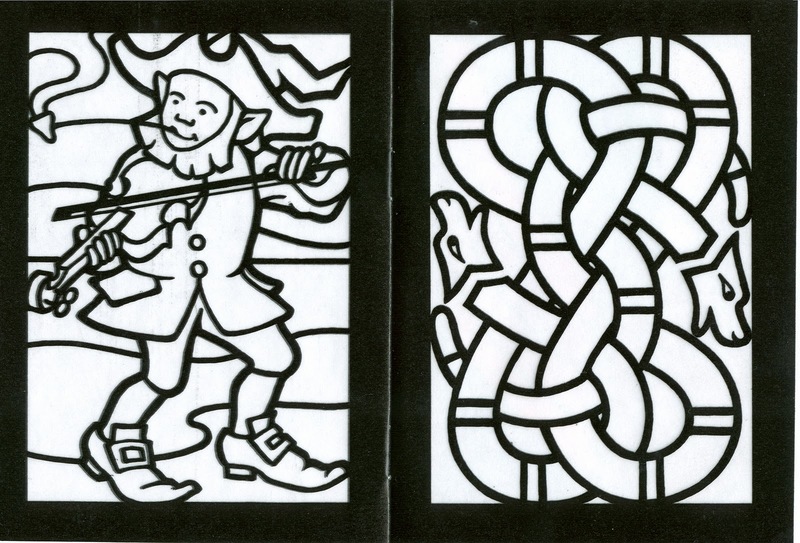 After cutting a few different designs in differing colors, spread them out on your work table/counter. Set out a few pages of the scrapbook in progress that you have. Get out some photos you want to scrapbook. Kirigami looks fab as photo frames! Ad one to make a big splash on your page. Use several pieces that overlap the edges and cut off the overhang. Save for later uses. Play with color combinations. Do at least ONE that is way out of your comfort range. You might end up really liking it! DESIGN IDEA: Use your glimmer mists and kirigami stencils in your spray box onto sheets of 12x12 or whatever size your scrapbook is. After drying, take the shadow images sheet to your work table. 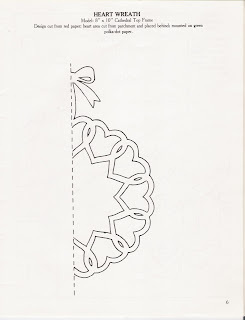 Use the same cut of kirigami to layer over, slightly off center, the glimmer mist shadow image on your paper. 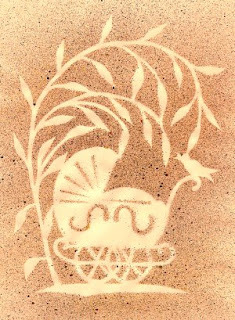 An example of colors: off white paper, gold and walnut glimmer mists, scrap kirigami to spray over, brown vintage look kirigami to layer. You are well on your way to completing a scrapbook page with vintage photos or memorabilia. Note how the image is reversed. These 2 pictures are not my own. Unfortunately I have lost the info on who it belongs to. If you know, send me the info so I can give credit where credit is due. This kirigami uses the quarter page fold. You take one square piece of paper. Fold it in half. Crease well. Fold in half again. Crease well. 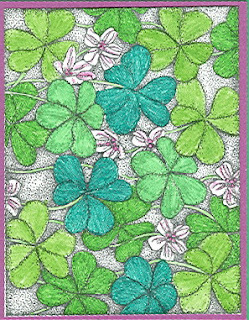 Print out the above shamrock design (copyrights by http://www.scissorcraft.com/). Fold using the directions above. 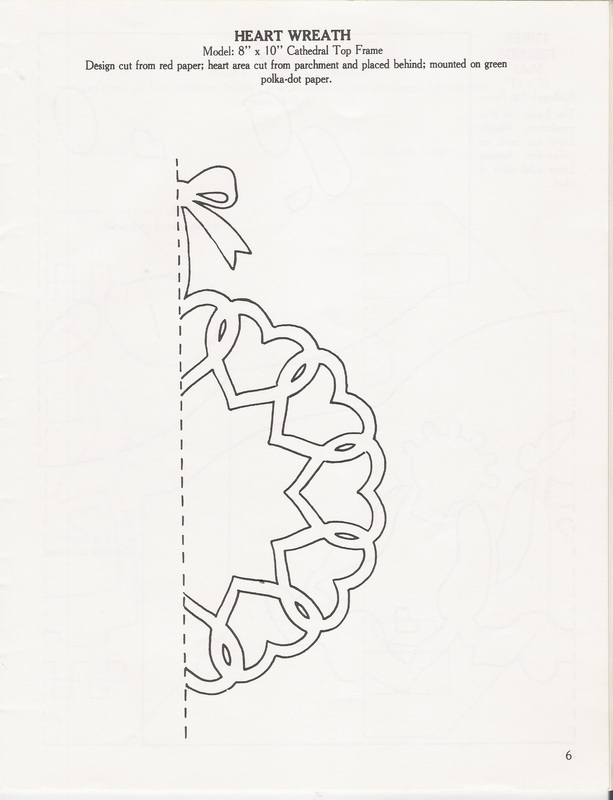 Now you have a 1/4 pattern that can easily be cut, or transferred to your desired paper. Spread open flat and admire your work! 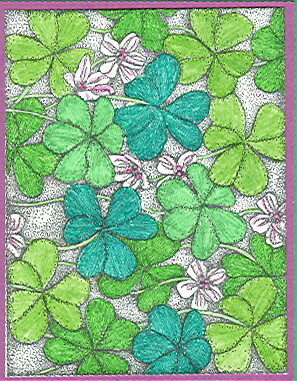 HINT: make sure that your shamrocks are overlapping, and that you don't cut between them. You need the connections to keep your kirigami in one piece. TIP: You can always iron your kirigami to make it flatter. Use a dry iron with no steam. Wouldn't these kirigami shamrocks look pretty with a spray of Glimmer Mist over the top? 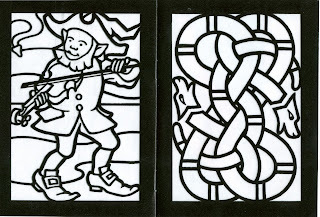 These two designs are copyrighted from DOVER PUBLICATIONS. They are found in the Stained Glass Book section. I would highly recommend that you subscribe to Dover's free downloads weekly club. 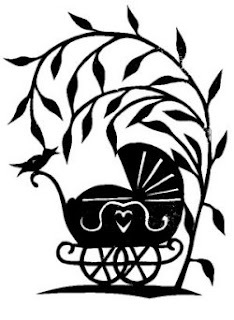 This is a heart design from the discontinued Back Street Studio line of books. It is definitely okay to use for your own personal use. I'm not sure where they stand on multiple uses, but the general rule is you can make 10 items using their designs for "pin money", but you can't reproduce it and say it is mine. This next card is a stamp from Peddler's Pack line of rubber stamping. Excellent line! I have stamped it onto the back side of a piece of acrylic. I'll give directions on how to do this with glitter tomorrow. "A friend's eye is a good mirror."